Time to take our new slot game out for a spin and enjoy the perfect melody of winning in the company of the classic The Big Bopper music with a rad 111% Match plus 33 Free Spins! Rock out with this 50’s inspired slot and hit the dance floor when you trigger the bonus games when scattered Bopper icons appear across the reels. Swing your hips to the sound of wins in the Big Booper Instant Win feature, the Chantilly Lave Free Games and the White Lightnin’ Spins! 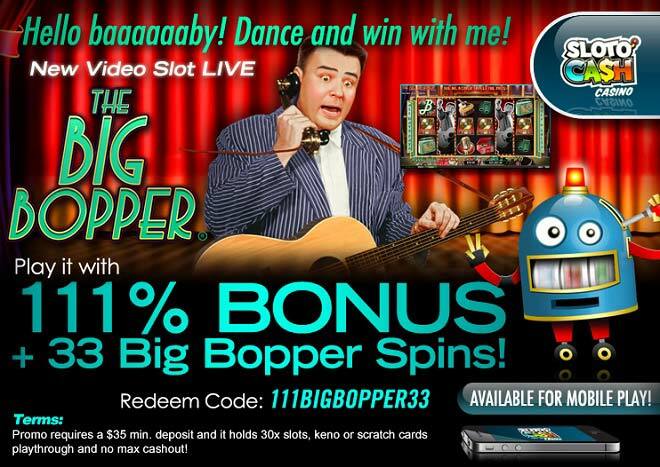 Time to rock and roll with The Big Bopper and collect riches with a 111% Bonus + 33 Free Spins!